Enter the league's front door to find yourself in the rocky cavern known as Victory Road. The trick here is to push the loose boulders onto the round switches to open up new paths. You must open the path to ladder D on the second floor. This leads to ladder E, which leads to the exit. Victory Road is a lot like Seafoam Island. Once again, you'll need a Pokémon with Strength, and you'll need to do a lot of pushing rocks around. 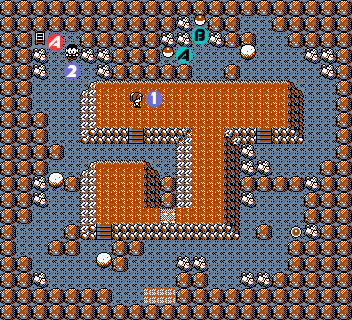 This time, there's a twist: The rocks must be pushed onto eye-shaped switches, which then makes those weird little red and white blocks disappear. 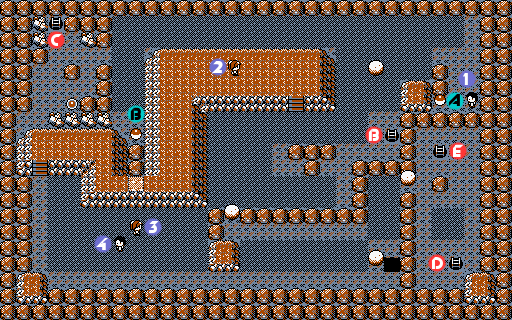 The first few are easy, if you're careful not to get the boulders stuck against a wall. But when you get down to level 3, you'll need to push a block all the way from one side of the dungeon to the other. Then loop around to the bottom, and push the next block down the hole to level 2, to open the final switch. You'll need a strong and versatile team to handle the many Junior Trainers here, but go heavy on Water Pokémon for the random encounters and Moltres. You can also find a hidden Ultra Ball in the lone rock near Moltres's location, and a Full Restore just before the exit, immediately to the left of the final ladder, in a rock. There's an interesting puzzle on the first floor. 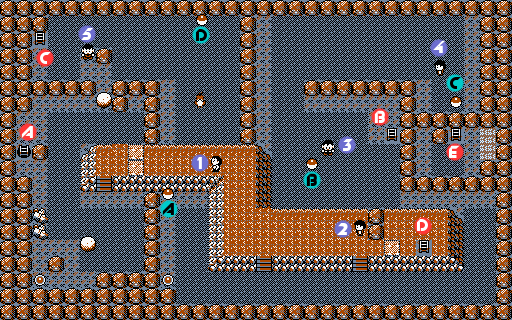 To get one of the items balls at the top, you need to push the rock so that it's blocking the other item. The only way to get both is to leave and come back, resetting the stone. Like Zapdos and Articuno, Moltres appears only once per game, so this is your only chance to capture it. Moltres is on the second floor, but to reach it, you must first take the ladder marked C to go back down. The Fire-type Moltres is at experience level 50, so be ready! There is an Ultra Ball on the free-standing boulder on the way to this Pokémon – don't forget to pick this up if you are running low on Poké Balls! To get a rock onto the switch on the second floor, you'll need to push it into the hole on the third floor, and jump down after it. Once you kick it all the way to the switch, its weight will depress a switch and you'll open the path to the dungeon's exit. Moltres, accessible though the C ladder on F3, is the last of the Ancient Legendary Birds. But fortunately, he's the easiest to catch. If you've been doing the Birds in order, you should have an Articuno now, and one Ice Beam from him should put Moltres directly into the red zone. Now you can toss Ultra Balls until you get a hit (if you're having trouble, reset and keep trying until Ice Beam freezes Moltres, making him a cinch to catch, or try using Hypnosis to put him to sleep). Note that the use of Blizzard is not recommended, as you are liable to knock Moltres out with one hit if your attacking Pokémon has a high level. This page was last edited on 12 November 2016, at 23:30. This page has been accessed 1,067,796 times.